During the summer months, my feet are free and I typically am wearing shoes that show off my polished toe nails. Still, I am always on the look out for cute, comfortable and practical socks. When I was teaching, I used to wear different fun socks each day. My students would look to see what was on my feet each day. Would they see a funky argyle socks, snowmen, pumpkins or my Chanukah collection each December? When I was given the opportunity through Family Review Network to review some socks from Socks4Life, I immediately said yes. As a sort of sock snob, I figured I was perfect for this. I am very particular about socks and like them to be comfortable, high quality and fit with specific shoes that I have. Welcome to Socks4Life! We carry only the best brands and models of socks on the market. If you’re shopping online for quality socks, we definitely have what you’re looking for. We are committed to offering you the finest socks at great prices while providing exceptional customer service. When you go to the Socks4Life you are greeted with a user-friendly website. You can browse for Men’s Socks, Women’s Socks, or Kid’s socks. If you want to be more specific then you can browse by style which includes Athletic, Diabetic, Dress, Liner, Slipper, Slouch, Thermal and Work socks. Shopping by color is also a possibility in order to view socks groups by black, blue, brown, gray, green tan, white, milti, orange, pink, purple, red yellow and more. 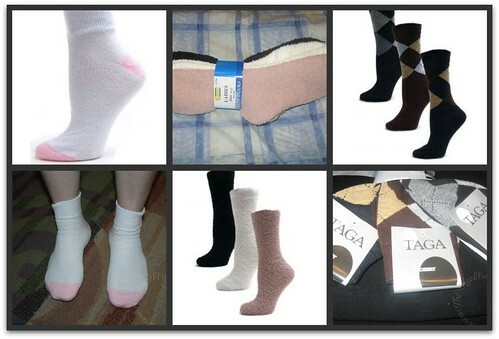 If you are more particular about the length of the socks you wear, you can also browse through ankle, crew, knee high, low cut, no-show and quarter socks. You really can personalize your shopping experience when on the Socks4Life website. Socks4Life also has a 30-Day Money Back Guarantee posted at the top of their website. In addition to this, you do not have to hunt for a phone number to call. Socks4Life proudly displays their toll-free phone number to call Monday through Friday along with their hours. The pink heel and toe quarter socks really surprised me. They were extremely comfortable thanks to some cushioning in them. I wore a pair with sneakers to the fair on Saturday. We did a lot of walking while there and my feet never hurt. Usually, after a while with my traditional socks, they are rubbing wrong or tired. The cushion in the socks really gave my older sneakers new life. I wore the argyle socks to a business meeting the other day. They are a thinner material that is perfect thickness for use with a nice shoe. My only concern with the socks was that they were snug on my size 8 to 8 1/2 foot. The socks say that they are for shoe sizes 9-11. I will likely wash these in a delicate cycle with cold water to make sure that they do not shrink since I fear they may not work if they get any smaller. Overall, I really liked the argyles because they were funky, fun and still sophisticated enough to wear for business. The soft socks are just what the name promises – soft! They were warm, snuggly and super soft. I think these will get a lot of use when the cooler autumn and winter months are here. I think I am also going to put a pair in my bag when I go to my parents house. With their central air, I often want a pair of socks to keep my toes warm. These would do the job quite nicely. Thanks to Socks4Life, one lucky winner will receive a $25 gift certificate to Socks4Life. MAIN RULE – Answer the following question: If you win the $25 gift certificate to Socks4Life, what item(s) would you purchase? 1 Bonus Entry – What are you favorite style of socks and why? To enter, please follow the rules above within the comment section. Contest starts today August 26 and ends at 10:59 EST on September 9, 2010. You do not have to be a blogger to enter, but must leave a valid e-mail address for me to contact you for mailing address once the giveaway is over. I will select the winner using random.org and contact you via e-mail. You will have 48 hours to claim the prize. If there is no response, another winner will be selected. Open to U.S. residents only. Disclosure: This post was written for Family Review Network & Socks4Life who provided the complimentary product in exchange for my honest reviwew. No other compensation was given and all opinions are 100% mine. I always get to September and realize I don’t have ENOUGH socks to see me through the winter and it’s a scramble to start collecting pairs here and there- so count me in! …because I love knee socks the best! My favorite style are definitely those which have stripes. Of course! How can you go wrong? Definitely the soft socks, the striped… maybe even the mary janes. My feet are always cold in the winter. I would get the slipper socks. I would get the mens athletic crew socks – my husband manages to lose a pair a week! I like Julietta Bright Argyle Socks. I would get the American Made Kid’s Blue Heel and Toe Crew Socks & Taga Women’s Argyle Dress Socks. I love different patterned/funky socks for fall/winter. Fun! My favorite style of socks are the ankle length style socks. I like the shorter style during the summer months when I wear shorts and tennis shoes. I like the Sole Pleasers Men’s King Size Assorted Diabetic Quarter Socks, because this is the kind the Dr says to get. I like knee highs in the winter. Thank you to everyone that enterered and to Socks4Life for sponsoring the giveaway. The winner has been selected and an e-mail will be heading to them momentarily.